Using the Visualizer action with the CLI module offers a large number of varieties to create different and in addition separated views of a PDF file. 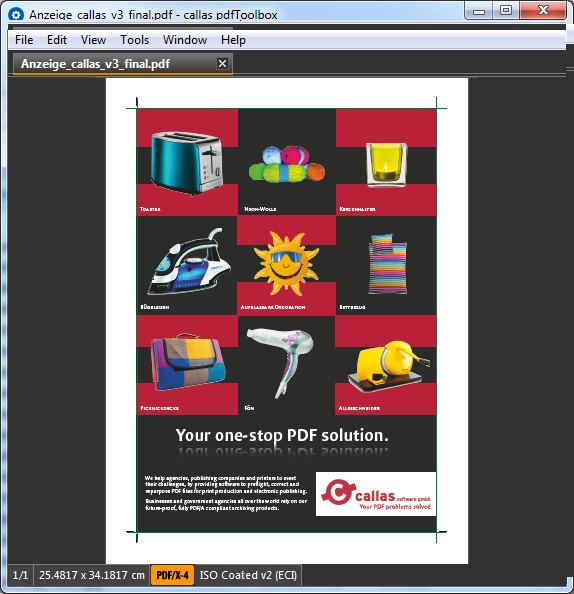 This article will illustrate some fine possibilities to create different, rasterized separation of a PDF. To create pre-separated, unrasterized pages from a PDF for each existing colorant, please refer to the Action "Create pre-separated pages". It is important to know that all objects which are not using CMYK or spot color will be converted to CMYK internally during the rasterization. 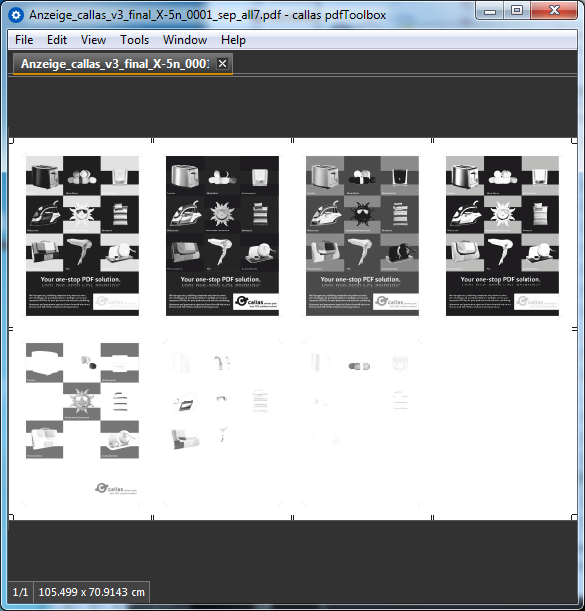 The single page PDF shown above will result in 4 indiviual JPEG files, each named with the page number and the name of the separation, e.g. 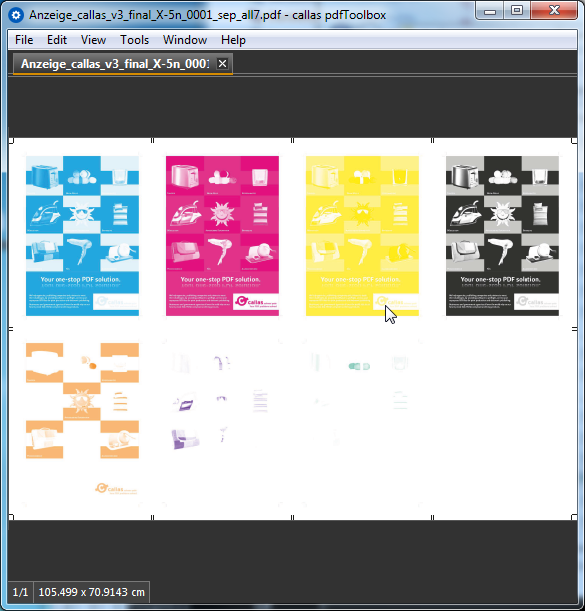 : "Anzeige_callas_v3_final_0001_sep_Black.jpg"
The image below shows the 4 separations assembled to one page, the order (top to bottom, left to right) is CMYK. You'll find the sample file used for this example below. By default, the separated views are created as RGB images. 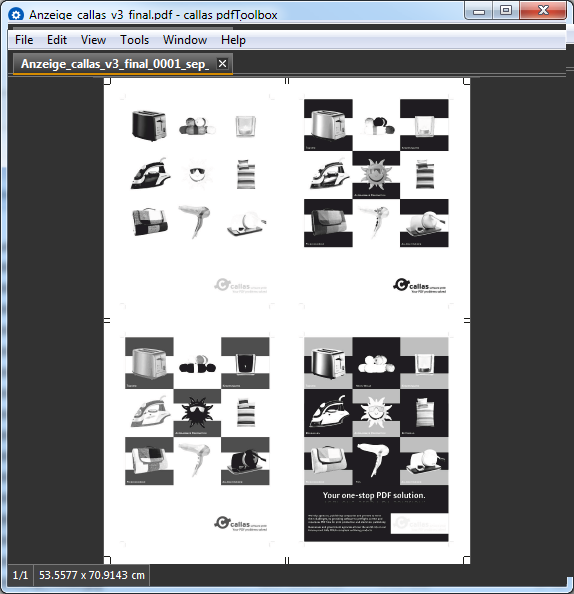 Using the parameter "--colorspace=gray", the created images will be in grayscale. This option should not be used with the "--sep_colors" parameter. 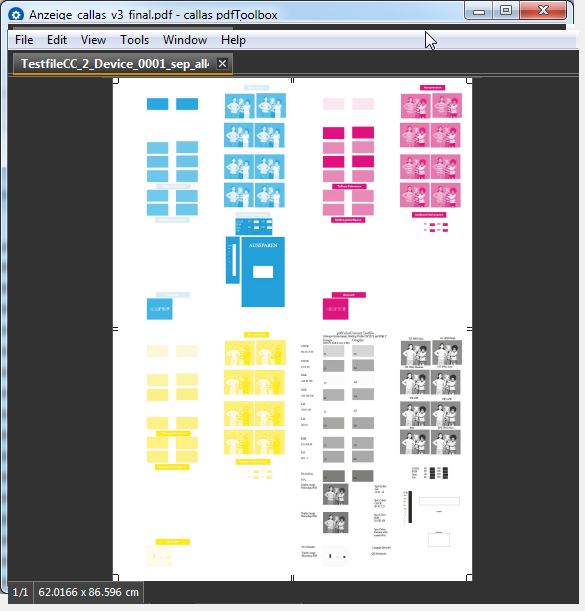 The PDF, which can be used for this example is a variant of the one used above, but has been prepared for printing on a 7C digital printing machine. 3 for separations (Orange, Violet and Green). This can be combined with the "--sep_colors" option of course, to visualize the colorants in a more user-friendly way.